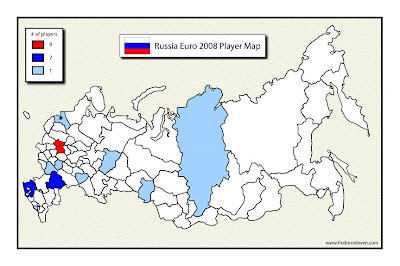 This map shows where the players on Russia's Euro 2008 squad came from in the vast country. I assumed that the whole team would be from Moscow and St Petersburg, but they are from all over the country, including one player from eastern Ukraine and two from the Siberian region of Russia. Krai and Oblast are terms that roughly translate to province, region, or territory. Dmitri Torbinski and Dmitri Sychev, both from areas of Siberia, are the only two players from the Asian section of Russia. Vladimir Gabulov's North Ossetia-Alania is a Republic in Russia, or an area of non-Russian Ethnicity. It is in southern Russia's Caucasus region near disputed Chechnya. Many people speak Ossetic in this Republic which is an Iranian language. Dmitri Torbinski was born in Norilsk, Siberia, which is the northernmost city in Siberia and the world's second largest city above the Arctic Circle with a population of just over 200,000 (Murmansk in Northwest Russia is the largest). It's also one of only two large cities in a continuous permafrost zone. Renat Yanbayev is of Tatar ethnicity who are Turkic people that once made up the western part of Genghis Khan's army in the 13th century. Today there are nearly 7 million Tatars in the Caucasus region of southern Russia, with 97% practicing Sunni Islam. Sergei Semak is from Ukraine's easternmost province, Luhansk Oblast, where nearly 70 percent of the population speak Russian rather than Ukrainian.